We began a recent project for a group of clients by creating long and short lists of possible names. Once we chose the top contenders, we moved to the task of designing potential logos. Since the logo is destined to be a key representation of the company’s brand, we’ve been working to make sure this graphic elements are eye catching and appealing. The right graphic, we know, will visually communicate the right message about the company’s business, industry, and/or product. What does this mean for you? Choose your own name and logo carefully, making sure it will conjure a mental image of what working with you or buying your product will be like. When designing, plan a logo that will communicate with the senses. Choose something visually compelling. Consider words that tell people what your company stands for. Do you want to be known for strength, integrity, beauty, luxury, affordability, ease, technology, health, fun, freshness, or efficiency? Then, design a graphic to match the words you choose. Let your logo guide your audience to an understanding of what people can expect from you. First, I wanted to communicate that we are grounded and competent. My logo needed to communicate boldness, sensibility, and strength. I want our audience to envision a company with the ability to address tough stuff. So, I started with a strong font from the Futura family for the word BOLD, and a thinner Futura font for the words Marketing Solutions. I adjusted the spacing and heights a bit for contrast and size. Then, I paired the name with a contrasting and friendly tagline font. Since my firm offers logo, graphic and Web design services—and we excel at coming up with smart taglines—I wanted to communicate creativity; I added a palette of bright, bold colors. I particularly wanted to communicate forward and upward momentum by us and for our clients. We are quality and process-improvement focused, so I created an arrow inside the “O” that points as if it is trending upward on a graph. I wanted people to get from my logo a sense of what to expect. I anchored the “O” in black—a power color—that ties in with the text color I often use, while the top half of the “O” is blue, which connotes stability and serenity. I’ve been told by many clients, by the way, that I help keep them calm during crises. Moreover, I packed a lot into four little letters. My BOLD name itself is an acronym designed to communicate the services I sell. B stands for branding, O for optimization strategies, L for linking, and D for developing personnel and skills through programs, coaching and mentoring. I think it works well and when I speak before groups, this acronym helps me focus on the key components of value I want to deliver to my audience. For help deciding among the colors and taglines I played with, I emailed various versions to a focus group of friends, business colleagues and families. I gathered their opinions and factored them into my choice. Later, while creating the new look for this blog, I applied only the same “BOLD” letters from my marketing logo to the blog name. That helped me tie my visual and written communications together—a good goal for every marketing project. Once you get going—especially if you are just starting out in your business adventure—focus on designing a great look for your company name. Your name is the most important element of your logo. That’s one reason why many logos have no picture attached. Designers simply choose a great font that can communicate an intended message on its own. Designers may choose two fonts that contrast when there is more than one word in a name. Designers look for contrast because it attracts the eye. Sometimes, they create contrast through color or by tying the logotype to a terrific tagline of another size or font. Color, contrast, typography and the balance of fonts, as well as the icon itself, all affect project success. If logo talk makes you think of Apple, Target and IBM success—which all boast instantly recognized icons—remember that those companies put millions of dollars behind those symbols. But big advertising bucks are not the “Be all, End all” behind every brand name. In your own case, YOU are, and so are YOUR PEOPLE. Your people may be your employees, friends on social media, store customers, journalists or tribe members with an influence on how others view your company and products. While thinking on that, remember that the products you produce and your company’s service style will do more for your brand than any good design will. If you are really strategic, lucky or talented in social media promotion, you may be able to spread your name and brand brand art quickly and build rapid brand recognition even on a marginal budget. So, whether you choose to promote your name in a big way or roll it out slowly over time, stay mindful of your customers’ intended and actual experience if you want to make your name count. For more information on branding, please check out Marketing Demystified, which addresses all facets of branding and marketing in its reader-friendly 380-pages. And if you like, you can order a signed copy of Marketing Demystified, written by me, Donna Anselmo, on my Website. If you order there, I will sign your book and can even add a special message of your choice. Just fill in the simple form on the ordering page and let me know your intention. This book makes a great gift for people who love to learn how to implement new information. Also, feel free to check out www.BoldMarketingSolutions.com, to learn more about what the BOLD name represents. Wondering What We Chose for Puppy Names? 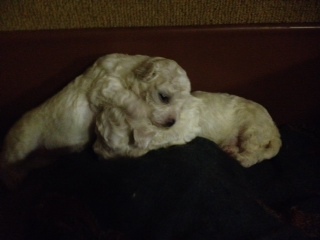 As for our twin Bolognese puppies, it looks like we will choose Ceili (pronounced Kay-lee) and Carter for these little white fluff balls—at least until we experience them first hand and make sure their names fit their personalities. Ceili—the Gaelic name for an Irish dance celebration—seems fitting because we believe we and she will dance with joy when we get to know one another. We chose Carter for her twin brother because it sounds good with Ceili, rolls off the tongue easily, and we happen to like it. Last but not least, each name starts with the hard “C” we used when we called for our little Chloe Joy, which will remind us of years well spent with her. 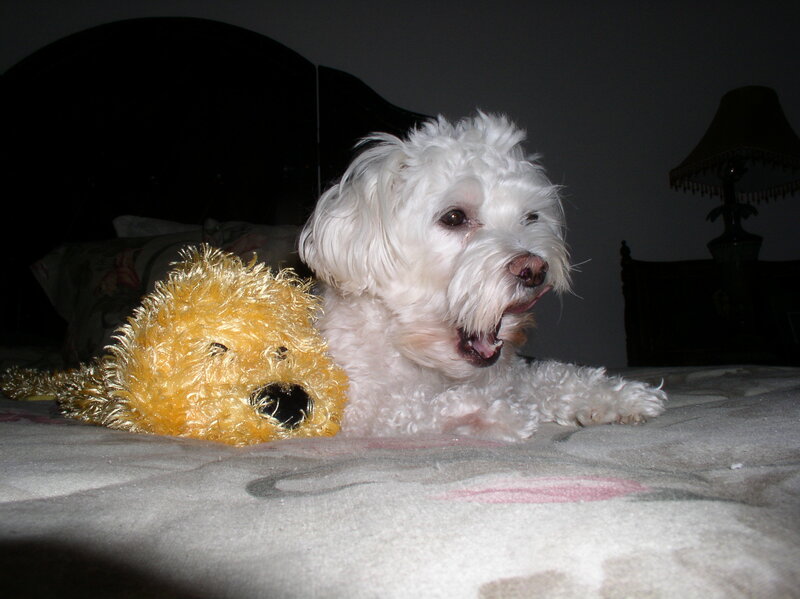 Chloe was the spunky, very loveable and still juvenile Malti-poo we lost last month to an autoimmune disease. Chloe was an incredible trooper with a beautiful spirit. Buying two new puppies right on the heels of losing her is a tribute to the wonderful companion we had in our little girl. It will surely take at least two pups to live up to her reputation as the best dog ever. Her name will be long remembered by many. She made her presence felt and the experience of knowing her worthwhile. And if she was here, she would surely have a great time playing with the pups. Hopefullly, her spirit will influence them as it has me. CHLOE JOY, with a favorite toy. So sweet. This entry was posted in MARKETING TIPS, PERFORMANCE SUCCESS, PROMOTION SUCCESS, SUCCESS STRATEGIES, UNCATEGORIZED and tagged Bolognese puppies, brand, ceili, choosing a logo, Donna Anselmo, Gaelic name, logo, marketing, Marketing Demystified, name, reputation, White Raven Bolognese by Donna Anselmo. Bookmark the permalink.